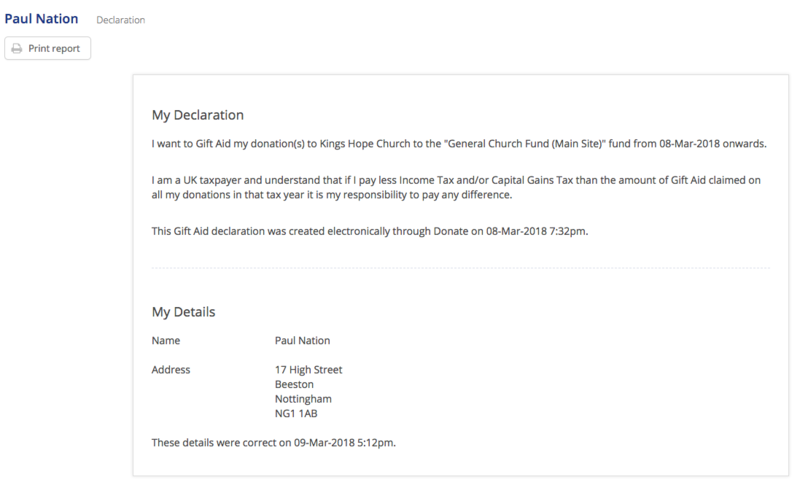 The ChurchSuite Giving module enables you to easily keep track of your church's Gift Aid declarations. 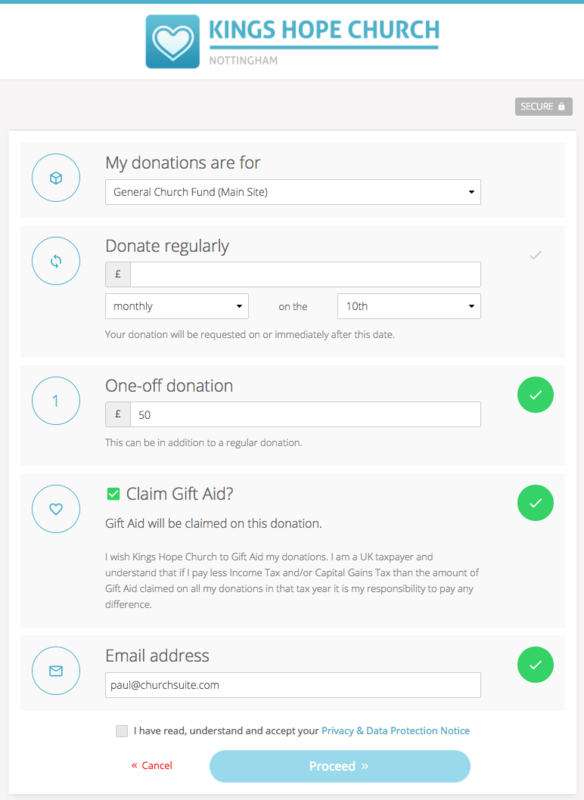 There are different ways in which you can manage your givers' Gift Aid declarations through ChurchSuite. ChurchSuite records the start date and end date of a declaration. This should not be confused with the date the declaration is signed. If the Giver opts to give Gift Aid on all previous donations up to the 4 year maximum, you must enter a start date 4 years prior to the declaration date so that ChurchSuite knows when to claim Gift Aid. Failure to enter a correct start date will result in donations showing as "Not claimable". If you experience donations shown as "Not claimable" check that the Declaration start and end dates have been entered correctly. Go to "Giving" > "Givers". You will see a list of givers in your church. Click on the name of a giver. This will bring up the Giver profile page. Now, click the "Declarations" tab. Here, you can see any present Gift Aid declarations. If you want to add a new Gift Aid declaration, click the "Add Declaration" button. Fill in all the details (as shown below). You can optionally leave the end date blank (for declarations that will run until further notice), unless specified by the giver, and click "Save Changes". 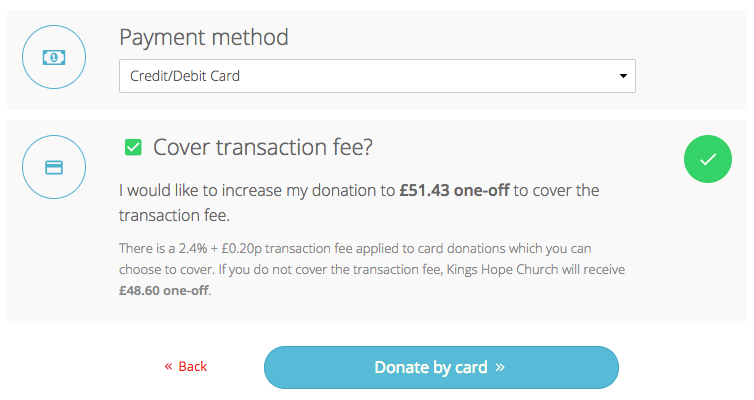 ChurchSuite Donate enables churches to receive online donations through their website. As part of the process, givers can tick a box which adds a Gift Aid declaration for the fund into which they are donating. During the online donation process, ChurchSuite will collect all the HMRC required information, such as the Giver's name, address and postcode. Additionally, and depending on the settings in your Giving module options, the Giver can be invited to increase their donation to cover the transactions, so that your church receives the full donation, even after the transaction fee. Now, back in ChurchSuite in the Giving module, when viewing the Giver's profile page (either pre-existing due to former donations, or newly-created for a first-time, new Giver), the online donation is shown. Selecting the 'Declarations" tab displays a confirmation that an electronic declaration was completed. Clicking the 'pencil' icon displays the full declaration. This can be printed if desired. In the My Giving section (if enabled in the Giving module settings), church members can add a Gift Aid declaration, including specifying which fund(s) the declaration applies to. Click "Add declaration". Select which funds (or all funds) and the declaration start date. The system will allow you to back date a declaration by up to 4 years in line with current charity Gift Aid legislation which allows churches to reclaim Gift Aid on donations in the previous four years. The end date is optional. If left blank, the declaration will run indefinitely until such time as the church member advises you of an end date. Once the declaration has been saved, no changes are permitted. Changes, such as ending a Declaration, must be communicated through the church office so that giving records can be updated accordingly. 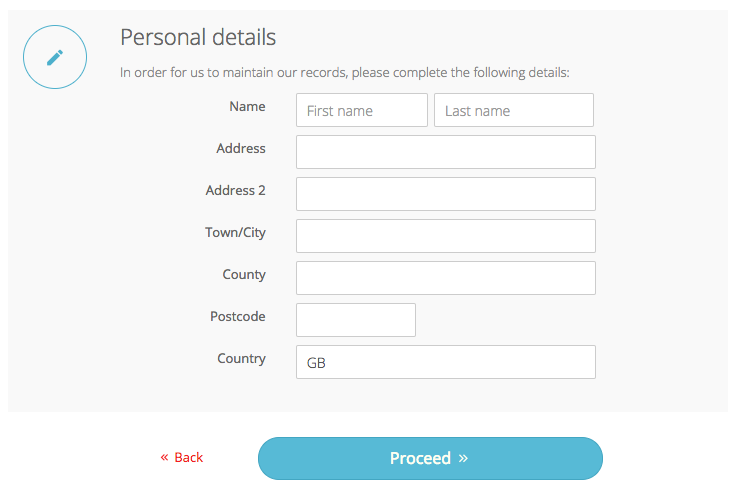 Note: To comply with HMRC Gift Aid requirements, your My ChurchSuite users will only be able to add a new Gift Aid declaration if they have a valid UK address recorded in the My Details section of their profile. ChurchSuite also allows you to upload and store 'scanned' copies of paper Declarations against each of your Givers. Once uploaded and stored, HMRC allow you to rely on these scanned copies, saving the need to also retain the paper copies. To upload a scanned file, select the appropriate Giver in "Giving" > "Givers". Open their profile and select the "Declarations" tab. Click "Add declaration". Complete the details in the normal way (as described above). Before saving the changes, click "Choose File" to browse and select the previously prepared scan file of the declaration. Note the file requirements - PDF, JPEG or PNG formats not exceeding 2Mb file size. Once uploaded, click "Save Changes". You can view an uploaded Gift Aid Declaration at any time by simply navigating to the "Declarations" tab of a Giver profile. Simply click "View file". You can also remove an uploaded file by clicking 'x'. The Giving module Gift Aid reports (UK customers) make it really easy to identify Gift Aid declarations that may be potentially missing for your givers. Running the "Declarations Missing" report you can view all active givers without a current Gift Aid declaration on file. From here you can Tag those contacts for later follow up, or you can communicate directly from the report; perhaps sending an email enquiring whether their giving is able to qualify for Gift Aid relief. Your church may have givers who are not eligible to make a Gift Aid declaration. It may be useful to record this in the giver Notes, or to Tag these givers. By using Tags in this way, you could then "exclude" that Tag from the Declarations Missing report using the Tag filter - this would then leave you with a more accurate list of declarations potentially still missing.